Much has changed since I last came this way. 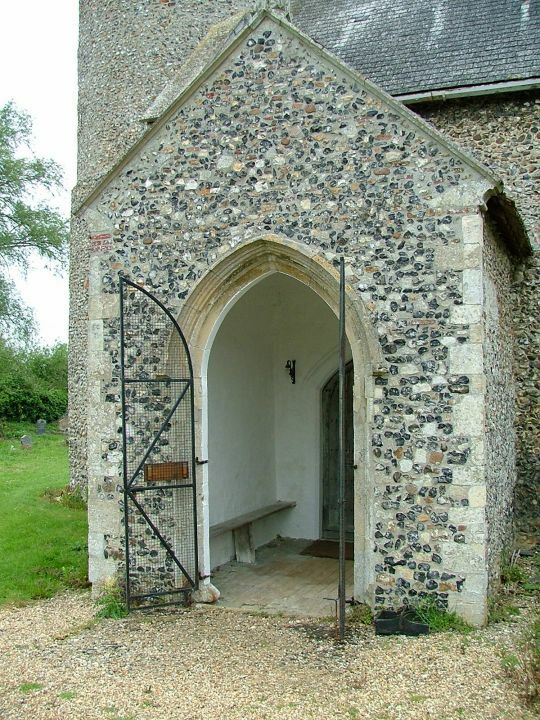 Back in 2005, most of the churches in the Waveney Valley area were kept locked, including Rushall, but today it is open to visiting strangers and pilgrims every day. It is exactly the kind of church which it is good to find open, because it contains nothing of great significance other than a prayerful interior made numinous by generations of Rushallers. 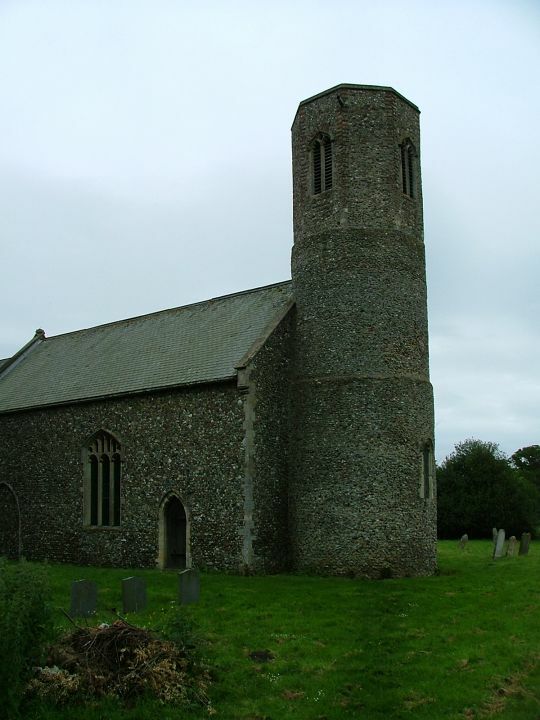 Simon Jenkins described the parish churches of England as the greatest folk museum in the world, and St Mary is one of the best reasons why. The word 'museum' implies a place which is no longer of spiritual significance, but that is not what is meant at all - rather, the building is a spiritual touchstone down the centuries to the long generations of local people, and the heart of their historic community. By being open, it becomes a living church, offering locals and strangers a place for spiritual contemplation and refreshment. Back in 2005 I had come to Rushall at the end of a long afternoon, just as the heavy skies were starting to weep. It was my thirteenth church of the day, but I had only found two of them open. Of the others, I had got into some by tracking down keyholders, but the rest were simply soulless fortresses, with no keyholder notices or welcome signs. At Dickleburgh, I had nearly despaired. Indeed, I wondered if they actually had room in their hearts to welcome the tax collectors and sinners who might respond to the sense of the numinous they'd find by wandering into an open church on their own, on a weekday. And at Scole I had been told brusquely by the churchwarden's wife that they simply didn't open the church to visitors. 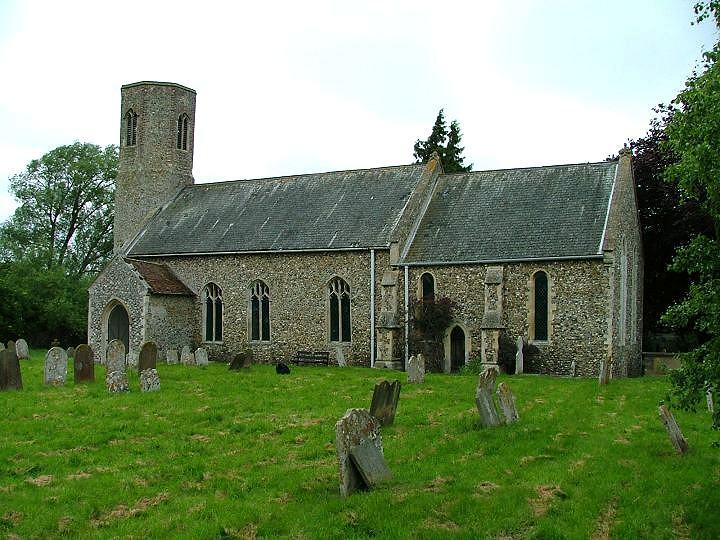 Now, like Rushall's St Mary, Scole church is open to everybody every day, and I am told that Dickleburgh's is too. As I say, much has changed. When you go cycling regularly around the East Anglian countryside, some days are better than others. I enjoy cycling in all weathers, although high winds can defeat me and rain at the end of the day makes me gloomy. Similarly, a day spent visiting medieval churches can uplift and inspire; but it can make the heart very heavy when you are locked out of almost everywhere. How good to return in sunshine and find the porch gates wide open! Rushall's round tower is an early one. Pevsner thought the traces of a former circular opening on the west side might indicate it was of Saxon origin. Towards the end of the medieval period the octagonal bell stage was added to the top. The exterior of nave and chancel is rather crisp, suggesting considerable renewal. Unusually, the east windows are in the form of a double lancet, such an un-Victorian design that it must indicate what was there before. On the north side of the chancel is a blocked doorway which once led to a chapel dedicated to the Trinity - you can see traces of the opening outside as well. Until the restoration it is said that a piscina also survived in what had become the outside wall. The prayerdesk in the chancel is rather striking, and the angels quite unlike any others I've seen in Norfolk. The First World War memorial contains the names of nine boys, which must have been a devastating loss in such a small and sparsely populated parish. A brass plaque recalls that the bell was put in the tower in 1912 for Mary Eliza Gape, by her sorrowing daughter. When new, it would have rung out for those nine young men.